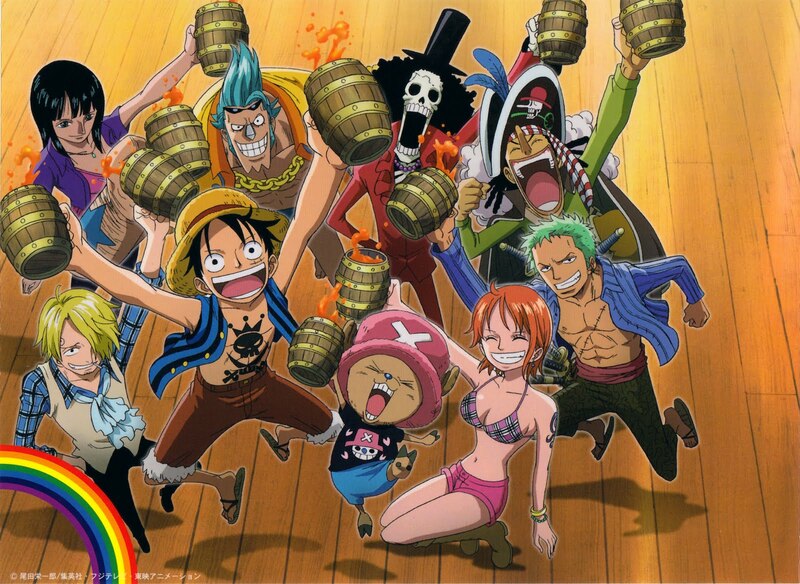 ‘One Piece is one of the most wildly successful anime of the past ten years, with an episode count well over 100 and twice as many chapters of the manga released. It has a huge following, and has been dubbed into English (albeit in a fashion even worse than FMA, for not only is it generic and poorly acted, but every gun, cigarette and drop of blood seems to have been changed). The premise is a simple one: Monkey D. Luffy is a young boy who has only one aim – to become the Pirate King. In a world dominated by pirates, he gathers around himself a crew of nakama, or close comrades. There is Zoro, the master swordsman and ex-bounty hunter. There is Nami, a clever young thief with a dark past. There is Usopp, a great teller of tall tales. There is Sanji, the chef and lady’s man whose kick is without equal. Later, there are others, including Vivi, a princess in disguise, and Chopper, the fuzzy little hat-wearing reindeer who is one of the cutest things in any anime. In the world of One Piece, there exist many ‘Devil’s fruits’, which bestow a life of great power on those who eat them, but when they come into contact with seawater, their bodies cease to be able to move. Why these people invariably pursue a life of piracy and spend their days floating on the one thing that would be lethal to them is another question, but in One Piece, it is the kryptonite to many characters’ super-powers. Luffy has eaten the gomu-gomu fruit, which endows upon him the bizarre ability to stretch his body like rubber, and the momentum of a fist on the end of an arm extended a dozen or more meters behind and then swung forward gives him a punch like a bullet from a pistol. The plot moves slowly, with simple ideas and long fight sequences. Generally, the pirate crew find themselves on a new island, where they find either a person in need of help or someone from their own pasts, discover a dire situation through a series of flashbacks, and then go and fight with whatever wicked person has caused the situation. Sound silly? It’s meant to be. Six years on, with the anime now at 500 episodes, and One Piece exceeded all my expectations: it certainly is within my list of best anime ever, certainly the manga is probably by third-favourite of all time, after Hikaru no Go and Yotsubato!. I seemingly wrote that during the Drum Rockies arc, which ended with one of the best emotional pay-offs of any anime ever. Since that, Nico Robin, Frankie and Brooke have joined the crew, each with a fascinating story. One Piece proved it could do fillers better than any other shounen, and with the Whitebeard war, provided the most epic conflict I’ve ever seen in a battle manga. More so than any other series, it can move its audience between laughing helplessly and holding back tears in moments. Oda managed to create a world that perfectly balances humour and seriousness, and that is why One Piece outdoes Naruto, Bleach, HunterXHunter or anything else action-oriented Shounen Jump has run since Dragonball Z. One Piece is just one of those series you either love to bits or just don't care about much really. It's actually kind of interesting to see how much the UK fanbase has grown in the last few years. When I first started watching it, not many people were actually watching it, maybe a handful. And now, people get annoyed since 'everyone goes on about it' and such. I think One Piece takes quite some sticking with to really grow to love - but once you're there, you're totally hooked.